Turmeric psoriasis is a phrase that is often typed in by psoriasis sufferers, though the word actually refers to turmeric, which is a yellow spice. Here, turmeric and termeric are used interchangeably though they mean the same thing so that if you are suffering from psoriasis you can get hold of the right information. Turmeric or curcumin has long been used in many parts of south Asia specially the Indian sub-continent, some parts of the Middle East and the Far East. It is known for its healing powers, specifically anti-bacterial and anti-inflammatory properties. Research is ongoing regarding the efficacy of turmeric/termeric, but anecdotal experiences of many psoriasis sufferers shows that using this spice has a positive effect on psoriasis. As it has anti-inflammatory properties, it reduces inflammation in the body, which is one of the major causes of psoriasis. Curcumin also has anti-oxidant properties so it combats free radicals in the body, thus improving immunity levels. Its anti-bacterial action prevents secondary infections that can result from scratching or even yeast infections. It also makes the body more sensitive to ultraviolet light and UV is a known agent that helps in psoriasis. This spice has a deep yellow color and even a little bit makes any liquid yellow, so you have to be careful of staining, whether you have it as a food or use it for application. Turmeric adds a deep yellow color to foods when cooked and it has a sharp taste, so it is used in small quantities. It is also cooked a bit or added to hot foods or liquids to take away the raw taste. This does not affect its medicinal properties. You can add it all cooked foods, soups and even juices and milk and you should have at least one teaspoon of dry powder in a day at various times. Some people recommend that you should add a little ground pepper to it so that it is more available in the body. 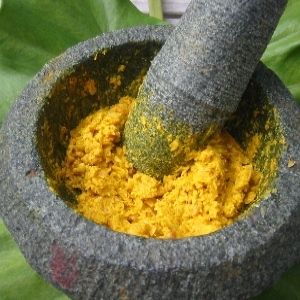 Turmeric psoriasis treatment can also be used topically. You can make a paste of powdered turmeric with water, milk or any lotion depending on your skin type and apply it to the affected areas. These should then be covered with gauze and you should leave it on as long as possible and then wash it off. However, turmeric can leave your skin looking yellow and if it stains any clothes, it can be difficult to remove. An easy way to use turmeric/turmeric psoriasis treatment is to take it in the form of supplements. You can start with 500 mg a day and depending on your tolerance and it efficacy increase the dose to 2-3 tablet/capsules a day. It may take a week for the treatment to show results, so you need to persevere. While natural remedies have few side effects you should know that turmeric/turmeric should be used with caution if you are on blood thinners of any kind as it has blood thinning properties. You should also be careful if you have digestive disorders, ulcers, gall stones or intestinal problems and sometimes turmeric can have an adverse effect. If you take in large quantities of turmeric, you may well sweat yellow, suffer from nausea or diarrhea or get skin irritation or itching. If you have any kind of reaction you must stop taking this spice in any form. If you are fed up with psoriasis and conventional drugs and treatments don’t work in the long term, you can well try herbal and natural remedies. Turmeric/Termeric psoriasis is an established remedy in Ayurveda and traditional Chinese medicine and research is ongoing regarding its efficacy in treating this skin disorder. You can talk to your doctor about starting this treatment and get his go-ahead, especially if you are taking other medicines.